Background: Person-organization fit is an effective factor for recruiting, selection, and retention of human resources in organizations. 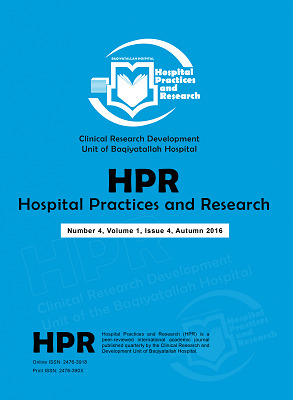 Objective: This study examined the correlation between person-organization fit and performance indicators used in healthcare in the hospitals affiliated with Qazvin University of Medical Sciences (QUMS). Methods: This descriptive cross-sectional study was conducted in 2014. A total of 324 employees were randomly selected from among the study population comprising the staff of teaching hospitals affiliated with QUMS. The sample size was distributed between the hospitals using the class-ratio method. Data were collected using person-organization fit (Scroggins) questionnaires, and their validity and reliability were evaluated. Data analysis was done using Spearman-Pearson correlation, chi-square, and Kruskal-Wallis tests. Results: In terms of values fit, personality fit, and skills, knowledge, and ability fit, hospital C ranked first among the hospitals tested with average ratings of 175.99, 195.53, 199.49, respectively. Significant relationships were found between person-organization fit and patients admitted per bed, median duration of patient stay, and crude mortality rate. No significant relationships were found between person-organization fit and the performance indicators of bed circulation and bed occupancy rate (p ≤ 0.05). Conclusion: In order to show an association between person-organization fit and the performance indicators, more efficient use of resources and improved efficiency is suggested. Policymakers must pay more attention to person-organization fit during recruitment, selection, and assignment of staff. Alaedini F, Mirza Sadeghi A, Karimi S, Moghari M, Maleki A, Tajik Saeedi J. Performance management system in Ziaeian hospital emergency [Online]. 2003 [cited 2010 Apr 20]. Armstrong M, Baron A. Strategic HRM: The key to improved business performance: CIPD Publishing; 2002. Chatman J, editor Matching people and organizations: Selection and socialization in public accounting firms. Academy of Management Proceedings; 1989: Academy of Management. Lewin K. Field Theory in Social Science, Selected Theoretical Papers, edited by D. Cartwright. D, New York, NY, Harpers. 1951. Amerioun A, Mahmoudi N. Hospital manager's leadership style from staffs viewpoint and its relationship with hospital indicators. J Mil Med. 2011;13(3):125-32. Ardalan MR, Salimi Q, Rajaeepour S, Molavy H. A study of Relationship between Person-Organization Fit and Organizational Culture in Western Iran State Universities) Hamedan, Kermanshah and Kordestan). Q J Res Plan High Edu. 2008;14(1):97-131. Amerioun A, Hosseini Shokouh J, Zaboli R, Karimi Zarchi A. Management style of military hospitals and its relationship with hospital performance indicators. J Mil Med. 2013;15(1):59-68. Ulutas M, Kalkan A, Bozkurt ÖÇ. The effect of person-organization fit on job stress and conflict: An application on employees of businesses in Dalaman international airport. Int J Social Sci Hum Studies. 2008;3(1):281-91.